Only in Florida: Baseball. Wonderland. And A WWE Smackdown. National Pet Week is May 1 through May 7, and all across Florida, dogs have multiple entertainment options in which to celebrate. And that’s great news for their human companions who may be looking for a little something different to do. Tomorrow night (April 29), Return to Wonderland is one of the most anticipated events of the year, bringing together more than 50 artists who will be displaying their work and talents. It is billed as an “Escape Down the Rabbit Hole For a Night You Will Never Forget.” Hosted by Barkin heARTS, the event starts at 8p and will go on until 2a at The Heights Tampa, 1910 North Ola Avenue, Tampa. A benefit for the SPCA of Tampa Bay, it promises to be daring, glitzy and fun. Contact Johnna at 813.541.2328. Up and coming artists, there is still time to get in under the wire to display your work. Don’t be late for this very important date. Another fun event that we dog lovers have been looking forward to is the 2nd Annual Pet Fashion Show and 2012 Calendar Kick Off Pawty, Saturday, April 30. Hosted by Paw Paws Pet Boutique and The New Barker, the event starts at 10a with registration, followed by the Pet Fashion Show. Westfield Countryside Mall is allowing dogs within the Mall for this fabulous fashion event of the year. The best part, dogs do not have to be in costume to participate. Just bring their pet pizzazz and personality. Proceeds will benefit the Humane Society of Pinellas, with an opportunity for your dog’s photo to appear on the cover of their 2012 calendar. For more information, email twila@HumanePinellas.org or call 727.797.7722, ext. 222. Across the Bay Area, (also on Saturday, April 30) it’s a WWE Smackdown with Superstar Christian signing autographs and mugging for the camera, all to benefit St. Francis Society Animal Rescue. There will be adorable adoptables on site (cats and dogs) from Noon until 5p at Citrus Park, 12835 Citrus Plaza Drive, Tampa. For more information call St. Francis Society Animal Rescue at 813.830.7251. Also on Saturday in Jacksonville, the Ratbone Rescues group is having their annual reunion and fundraiser at Dogwood Park from 9a until 6p. Or, if you happen to be in Lakeland, come out to support the Humane Society of Polk County at The Doggie Bag. Their April Concert Series comes to a close with a Gala Wine Tasting, with wine donated by The New Barker for the cause. Call 863.683.6220 for more information. The Doggie Bag is at 1745 East Edgewood Drive, Lakeland. Pet Pal Animal Shelter is hosting their annual Puppy Love Fundraiser Saturday evening with an exciting venue change. We’re looking forward to heading out to the Hilton St. Petersburg Bayfront, 333 1st Street South, St. Petersburg. There will be a sit-down dinner, silent and live auction, 50/50 raffles with live music by Screamin Donkey. Volunteers have spent the last couple of weeks prepping and wrapping some wonderful prizes. For ticket information, call 727.328.7738. Or we’ll just see you there between 6:30p and 10p. To stay pUP-to-Date, it’s a good idea to regularly check The New Barker calendar. Upcoming events include The Derby Jubilee followed by the Baldwin Park Doggie Derby in Orlando to benefit the Sebastian Haul Fund; Groovy’s Natural Pet Wellness Expo in Tampa’s Carrollwood; Pet Food Warehouse’s First Annual Pet Rescue Event, St. Pete. Those events and plenty more are in store for the weekend of May 6, 7 and 8. 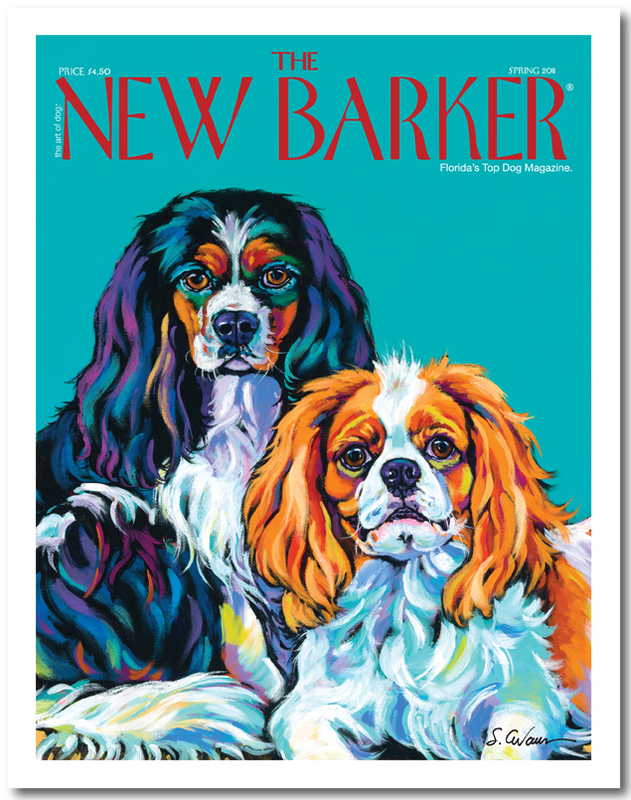 If you are a pet business looking for a great way to showcase your product or services, contact anna@thenewbarker.com. 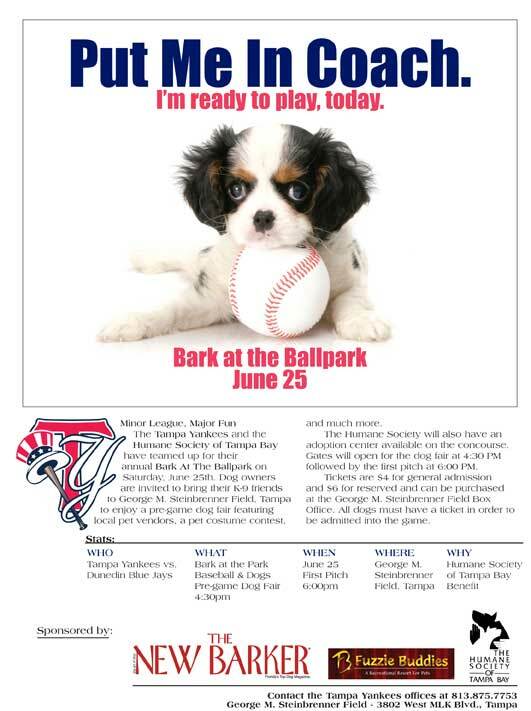 We are co-hosting several fun, dog friendly events including the Dog Days of Summer (May 20 in Trinity), Trail of Tails (May 21 in Jacksonville) and the Tampa Yankees Bark at the Ballpark (June 3, Tampa). If you haven’t already, join us in our daily posts and observations. We’ll see you around Florida and remember to dog responsibly. Previous Previous post: The Cultured Dog Has Options. Next Next post: Dog Days of Summer to Benefit Cindy’s Pets in Pasco.